What do you do if you aspire financial independence and early retirement and have a little time to spare? Do you go out to catch some rays? Or meet friends in town for a beer or two? Or will you just sit back and relax and feel fabulous because you know you’re on your way to FIRE? Nope. You fire up your laptop, start Excel and go over all your FIRE numbers one more time. That’s what I did at least. And created what I would like to call ‘the ultimate charts’. They’re beautiful. They’re awesome. But are they useful? Are they in any way a good tool for predicting how things are going to play out? Let me show you what I have done. The bars in the chart below show the total projected value of company shares (orange), total projected value of alternative assets (yellow) and the projected equity I hold in my home (blue). The light blue/orange area for the years 2018 and 2019 shows the actual numbers. As you can see, I am slightly ahead of schedule. How do I get those numbers? Well as far as the company shares are concerned I project an annual deposit of around $25K and an annual appreciation of 4%. The $25K deposit is going to be pretty accurate. The 4% gain is completely made up. In real life the annual gain will fluctuate and be both positive and negative. And the sequence of those returns will also have an impact. 4% is rather conservative however and with my (company stock) strategy I anticipate higher returns. Time will tell whether this will happen, but in the meanwhile the 4% assumption will keep me grounded. Alternative assets will primarily be crowdlending/funding assets. I project an annual deposit of around $3K and assume an annual income (interest) of 7% (which I will re-invest). See also the ‘deposit’ chart below; investments in company stock (orange) and alternative assets (yellow). The deposits, annual gain and interest would give me around $700K in total asset value to play with after I retire (this includes the equity in my home). I wanted to understand the role of the annual gain (4%) in the overall increase in company stock asset value a bit better, so I produced the following chart. What you can see is the annual increase in company stock asset value. The orange bars are my annual deposits (~$25K) and the grey bars the annual gain (4%). It is clear that – as the total asset value increases – the gain is increasing too. In the below a chart you can see the deposits (orange bars) and gain (grey bars) as part of the total asset value. So in total the value of my company stock asset increases with a projected value of a little more than $300K. Note that the chart only looks at deposits/gains since 2018. The total value of my company stock asset would end a bit higher than the chart suggests (for the simple reason that I already purchased company shares back in 2016). As you can see in the above chart, the plan is to save until 2027 (which means ‘keep working’ until then). That’s the year when I will turn 60. This is the magic number. My pledge: I will retire before I turn 60. This can not be negotiated! Let’s expand on the previous charts. Below I have added the withdrawals (negative bars) for the years 2028 until 2051 and how it impacts the value of my assets. 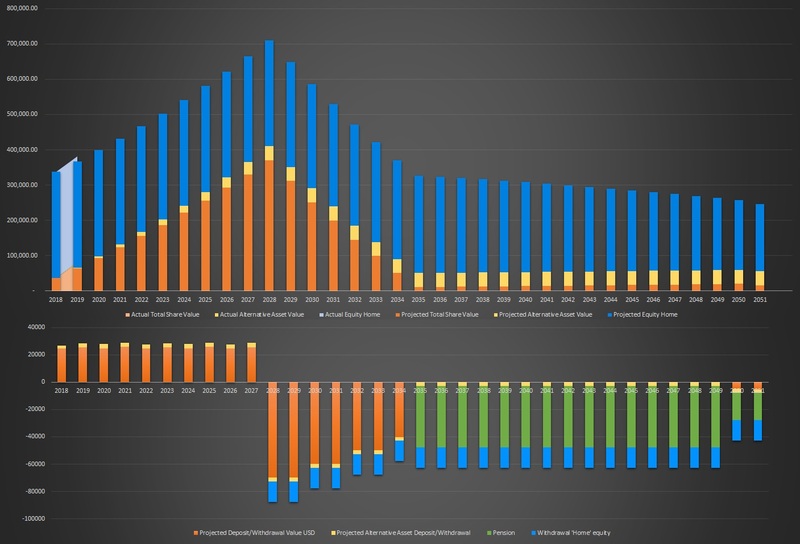 What you can see is that from 2028 until 2034 I would deplete my company stock asset (orange bars). I cannot avoid that, unless I reduce my expenses quite drastically. But it’s okay as from 2035 I will receive my pension (the green bars). As far as the equity in my home is concerned (blue bars), the above charts assume I sell my home (I’d move to a rental place) in 2028 and invest the money. I don’t know yet what I will invest in, but I assume an annual gain of 4%. From 2028 I will withdraw an annual amount of $15K from this ‘home equity converted into liquid assets’ pool. Due to the 4% annual gain, I would not deplete this asset (well not quickly anyway). The yellow sections in the above deposit/withdrawal chart represent the annual interest on my alternative assets, around $2.8K annually. So I am not reducing the principal investment, but just withdraw the interest (stop re-investing). This is a big unknown. If I were to invest in dividend paying stocks or other passive income generators, I’d be more confident I could get a specific rate and steady income. This is something I seriously consider. Right now I am in the accumulation phase and opted for a higher risk, aggressive expansion strategy. However, when I enter the withdrawal phase aggressive expansion will be off the table. Predictable income will be much more important. Talking about predictable income, I have projected annual investments in crowdlending/funding. The 7% interest rate is conservative and I am rather optimistic that real life will show better numbers. I may revise my strategy over time and invest much more in this particular asset class. It has the potential to generate the steady passive income stream I need when entering the withdrawal phase. This is also a conservative assumption. It’s not unlikely the equity will be higher in 2027, but to stay on the safe side I opted for keeping the equity the same. I will not retire later (my pledge), but I can definitely see myself retiring earlier. This is my secret weapon. If I were to opt to move to a cheaper city/country, I’d be able to retire much earlier. Other assumptions are that my company doesn’t go bankrupt, I keep my job for the next 8-9 years and the ESPP program doesn’t get cancelled. But I don’t think I have been overly optimistic. The returns are fairly conservative and I keep the equity I hold in my home stable. Reality may be worse of course. Like lower returns and/or a real estate market that collapses just before I want to sell my home. The purpose of my numbers and charts is not to make accurate predictions however. They’re more a tool for tracking my progress. What is good about these charts? The charts are projections and they are based on numbers that I can control (my deposits, withdrawals) and numbers I can’t control (annual gain, interest, home equity). I do not expect real life to behave like my charts at all. There will be deviations all over the place. However, the projections do help me understand, track and compare the actual value and performance of my assets. They help me to ‘measure’ the distance to FIRE. They also force me to think about my future expenses (an important key to FIRE is controlling those). Any model has flaws, except for super model Doutzen Kroes from The Netherlands. She’s flawless and so financially independent (is my guess) that she could retire today and have a daily bath in champagne for the rest of her life (I don’t have a chart for this though). I won’t have to finance champagne baths, but I do have other (more modest) expenses. However, on the expense side – after FIRE – I do not have a good picture of my requirements. What are my needs and wants? And what do those needs and wants cost in the future (inflation)? Also, if I want full pension when I turn 68, I have to keep paying pension contributions voluntarily after early retirement. This will be a major expense. So that definitely requires more work, more thinking and a bit more magic in Excel (when I’m ready with some more numbers and charts I won’t hesitate to share them with you). On the other hand, I do have some flexibility. For example, I could withdraw a bit more money from my ‘home equity converted into liquid assets’ pool. Worst case I’d even be willing to do a little bit of freelance (translation) work after I retire to supplement my withdrawals. And if you’ve clicked around a bit on my blog, you may have stumbled upon my geo-arbitrage posts. They’re about relocating in order to take advantage of the lower costs of a city/country. See for example my posts about Cluj in Romania and Braga in Portugal. There are dangers luring beneath the surface. I’ve already mentioned a few of them, like job loss, the discontinuation of my company’s ESPP progam and bankruptcy. Bankruptcy is a single point of failure (as fellow personal finance blogger Indeedably pointed out to me). If my company goes bust I’d lose my job and all my shares. It would most likely mean the end of my aspirations for FIRE. So why am I relying so much on company stocks? Shouldn’t I hurry and re-allocate money to other assets? In other words: Diversify? It’s a good point. I’ve headlined this post with ‘ultimate charts’, but they’re only ultimate until I change my mind. Chances are I will re-allocate company stock asset money to safer investments (real estate, bonds, etc). In due time. But for the next few years I am pretty comfortable with my strategy. Any feedback? Do you think I am too optimistic? Too conservative? I still sleep remarkable well even though I only own shares in the company I work for and base (part of) my strategy on a single stock. Would you? Those are some very detailed and interesting graphs! I’ve yet to really analyse my own numbers in such detail, I want to leave it until I have a couple more years of investing under my belt. It’s hard to say whether you are being too optimistic or too conservative, as it’s all guessing what might (or might not) happen in the future. Personally, I wouldn’t base my strategy on a single stock but that’s just me! I’m fortunate that in order for me to have a full state UK pension when I turn 67, I need to have contributed national insurance for 35 years. I only need 6 more years of contributions to achieve this and by this point, I should be at FIRE, or close to. Thanks Weenie! Yes, it involves a lot of guessing. The best thing is that these charts allow me to compare my actual numbers with my projections. As long as the real performance is better than the projected performance I am happy. I am comfortable with my single-stock strategy only because I get them for a discount and bankruptcy is highly unlikely within the next 4-5 years (never say never, but this is a calculated risk). But as I mentioned, I am thinking about moving money to passive income generators (dividend paying stocks, P2P lending, etc.). This will become more relevant as I get closer to retirement. Great you only need 6 more years to qualify for full state pension! My problem is that I have lived and worked in 4 different countries during my career. This has not been a good thing for my pension. Wish you a great 2019 too! I think that picking a year or an age to retire and repeating that over and over again as a fact, makes it a fact. Keep up the matra and it will happen. Anyway, I’m sure you’re going to diversify eventually, cause that just makes more sense. Almost any (tech) stock has been going up for 5+ straight years, but it looks like it’s going to be a bit more shaky going forward. Anyway, I hope you’ll be able to keep up with the trend! I’m already looking forward to the next new year update, now that I also myself have a fixed target to aim for (to stay on track). I wouldn’t say I am betting my entire future on a single stock. Part of my future is also the equity in my home. But yeah, the gains for the past 3 months are terrible. The gains for my 2018 investments are still 47% however (based on what I paid for the shares). In my upcoming post (with lots of eye-candy in the form of more charts) I will continue talking about my internal struggles and compare my single-stock ‘kamikaze’ strategy with dividend growth and crowdlending/funding strategies. I know I should diversify, but the question is when, how much and what assets? 🙂 Stay tuned! Regarding your single stock, you may have a big advantage. You know and understand your holdings (a big win) and if the company begins to lead to the wrong way, you will know first hand. That gives you advantge against others, as you will be able to sell quickly if thing gettting darker before any major loses. It’s just a thought, I don’t fully know how your company shares work, and if you would even have the possibility to do that. Thanks for stopping by Tony! It do have knowledge that others, not working for the company, may not have. It is not really a big advantage though. Insider trade is prohibited by law and also blocked by the company. I can never sell/buy shares close to major events, such as the release of quarterly figures, corporate take overs, etc. This article became “Article of the Month” on FIREhub.eu. Congrats!